Many people have opinions on the subject of romantic relationships-why they're so hard to find and so difficult to maintain-but the real source of trouble isn't too complicated: it's that we are choosing our partners based on love, excitement, lust, attraction, neediness . . . on feelings. Instead of helping listeners find true love, Dr. Michael Bennett and his comedy-writing daughter Sarah reveal the practical, commonsense criteria for good partnerships that will allow real love to develop. Finding a good partner involves losing preconceived notions about who your dream date might be, so the Bennetts helpfully appraise the pros and cons of eight traits people most commonly seek: charisma, beauty, chemistry, communication, sense of humor, family stability, intelligence, and wealth. They suggest you'll have better luck finding a partner in a bar or online if you focus on ideas like mutual attraction and respect and common interests and common goals. 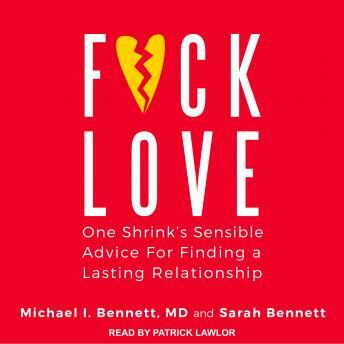 With helpful quizzes and case studies inspired by Dr. Bennett's practice, F*ck Love is packed with enough advice and wisdom to help you avoid the relationship nightmares that led you to this book in the first place.